on KE7 1d MCA wmk (SG.140), creased. (16 bar) on 6d (SG.4). (18 bar) on 1d (SG.3). (11 bar) on 1d (SG.3). 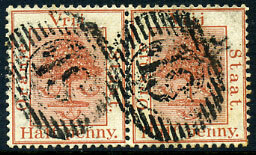 (16 bar) on 2d bright mauve (SG.50). (16 bars) in purple on 1/- (SG.9). (16 bar) on 6d (SG.6). (16 bar) on 1d (SG.68). (16 bar) in purple ink on 2d (SG.49). 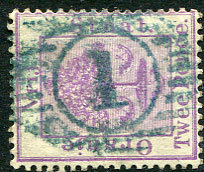 (16 bar) in purple ink on 1/- (SG.8). (16 bar) on 1/- (SG.9). (16 bar) on 4d (SG.18). (16 bar) on ½d (SG.48). (11 bar) on 1d (SG.1). (11 bar) on 1d (SG.2). (16 bar) on ½d (SG.48), thinned. (16 bar) on 2d (SG.49), slight soiling. (16 bar) on 1/- (SG.84). (16 bar) on 6d (SG.5), toning. (11 bar) on ½d (SG.48), perf. fault. (16 bar) on ½d (SG.84). 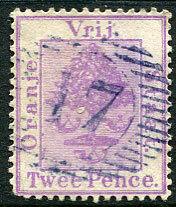 (16 bar) in purple ink on 1d (SG.2). (16 bar) on pair ½d (SG.48). (16 bar) on 6d (SG.5), creased corner. (16 bar) on ½d (SG.85). (16 bar) on 1d (SG.50). 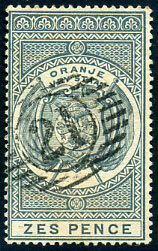 (16 bar) in bluish ink on 6d (SG.5). (16 bar) on 2d (SG.49). (11 bars) on 2d (SG.50).